Stand Up Paddle Surfing: Don't forget...Adler paddler event this Sunday - rain or shine! Don't forget...Adler paddler event this Sunday - rain or shine! 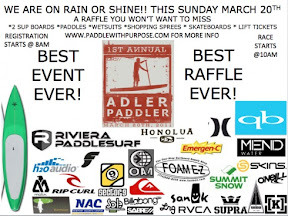 Be sure to get to the Adler Paddler Race/Benefit this Sunday, March 20th in Belmont Shores (Long Beach).